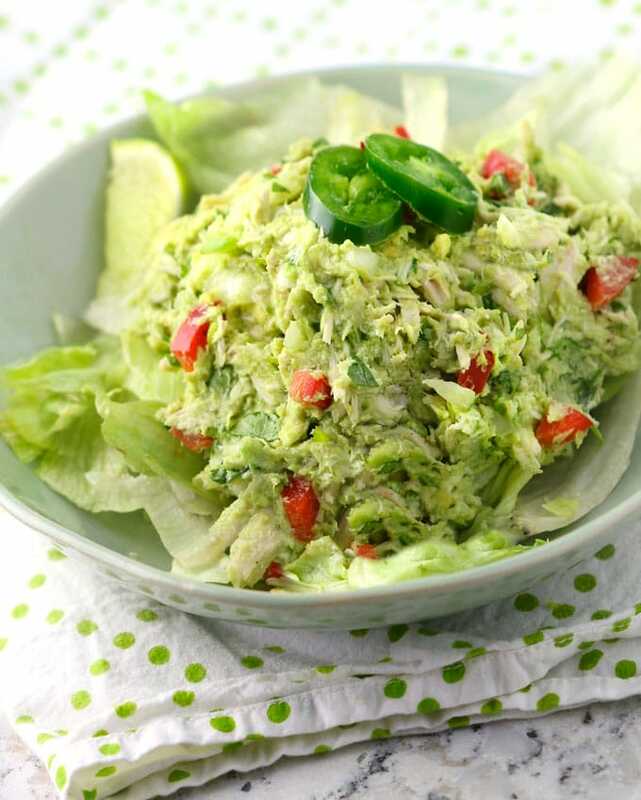 This creamy delicious Venezuelan avocado chicken salad gets is creaminess from mashed avocados and it’s vibrant latin flavors from lime juice, garlic and cilantro. A fantastic chicken salad recipe without mayo and dairy-free. 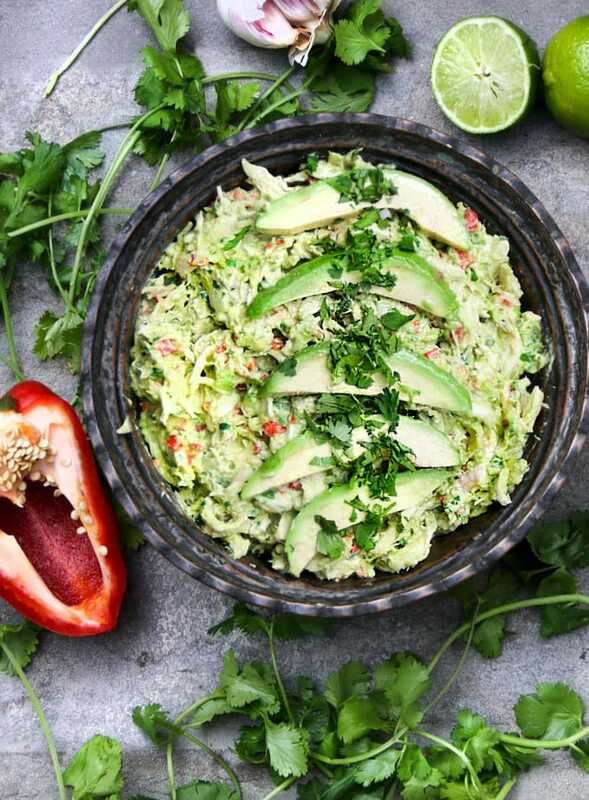 This avocado chicken salad recipe was originally designed to be the stuffing for a beloved Venezuelan dish called ‘reina pepiada: Venezuelan arepas with chicken avocado salad. 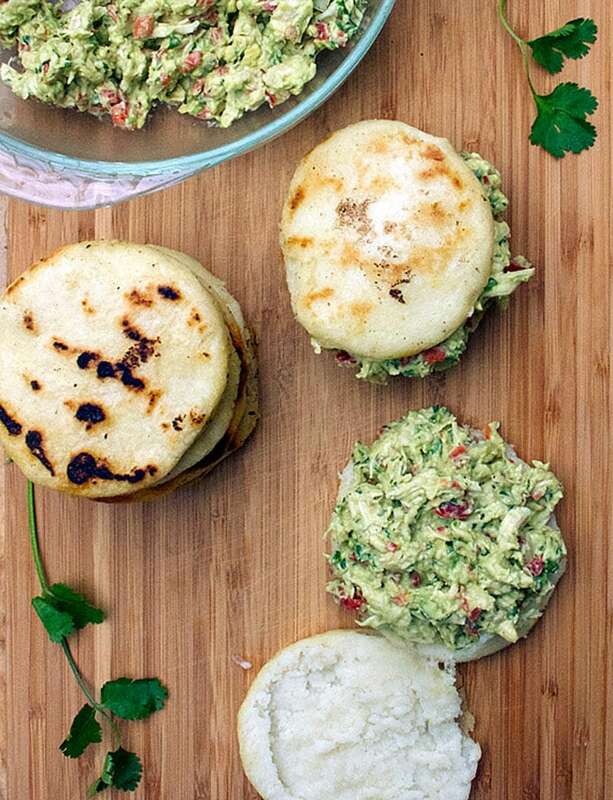 Arepas are gluten-free corn cakes, eaten in Venezuela instead of bread. I learned the arepas recipe from my Venezuelan friend Sonia. Though I adore this chicken salad sandwiched between delicious corn cakes, warm from the oven, I also find myself making the avocado chicken salad on its own often. I love to scoop onto a simple salad for lunch or to roll up in a wrap or make a a sandwich out of it. It’s great to have a delicious healthy chicken salad recipe in the repertoire. Over the years I’ve adapted Sonia’s recipe just a bit. The original recipe had mayonnaise in addition to avocados. I discovered that if I have perfectly ripe avocados to mash up for the dressing, the mayo isn’t necessary. Avocados have all the creaminess of mayo and they add a wonderful sweet and nutty avocado flavor to the mix. Plus avocados are highly nutritious, rich in vitamins, potassium and heart-healthy monounsaturated fat. This chicken salad is super flavorful. Just scoop it onto a simple, lightly-dressed green salad and you’ll have a fantastic lunch. You can adjust the amount of tanginess and heat by adding more lime juice and jalapeño. I’ve discovered many wonderful chicken salad recipes from all around the globe. 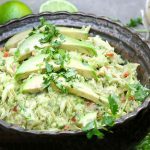 Here are a few of my favorites: This is the best Curried Chicken Salad I know and it’s of British origin; Salpicão: Brazilian Chicken Salad is a great brunch dish with loads of flavor, or try this delicious healthy Asian Cabbage Salad with Grilled Chicken. 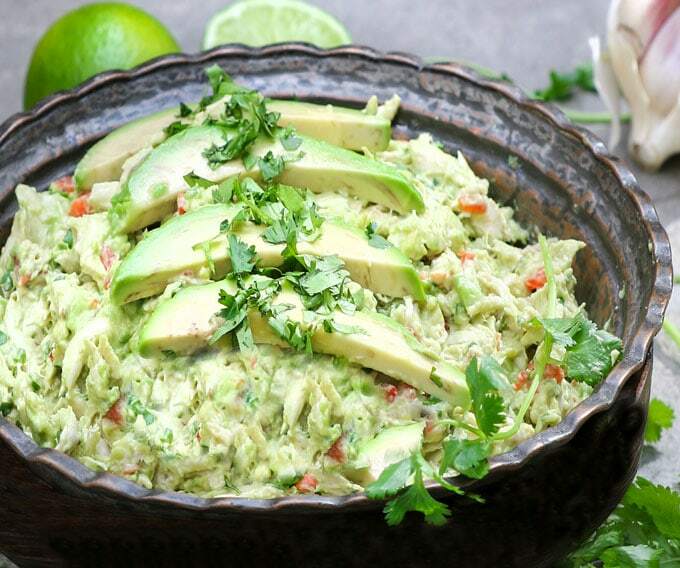 Here’s the recipe for Venezuelan Avocado Chicken Salad. I’m excited for you to try this one. If you do, I hope you’ll come back to leave a review and let me know how what you think. Healthy creamy shredded chicken salad with vibrant flavors, made with avocado, vegetables and herbs, no mayo or dairy. Just made this and it’s delicious. I had to pack it up right away for lunch so I wouldn’t taste it all away! Yes, this is certainly healthy. I personally don’t use mayo too. But mine started turning black right away! LOVE IT! Anything this time of year with avocados is HEAVEN! Thank you! There is a Peruvian food truck in the DC area that carries stuffed avocados – one option is chicken salad stuffed avocados – it is incredible. 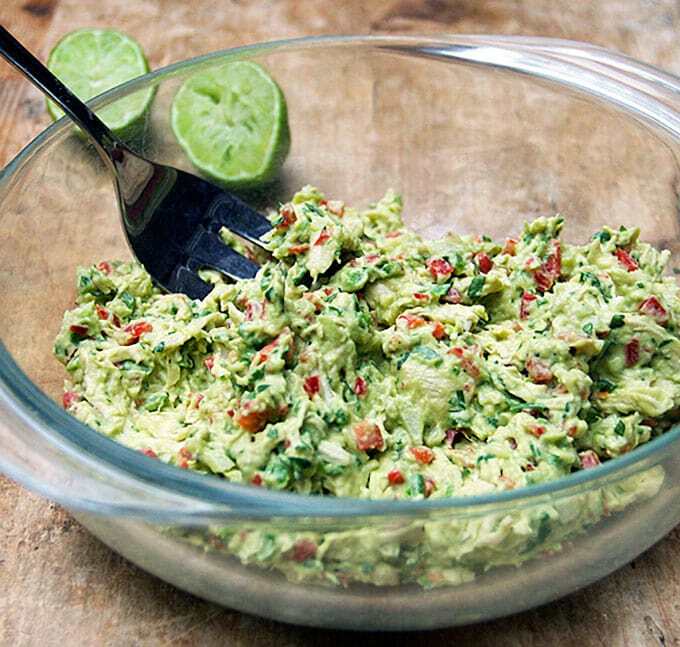 In trying to do something similar, do you think one could follow this recipe but substitute a little mayo for the avocados and then stuff (or fill) an avocado half instead? How will that affect the proportions of the other ingredients? Yes ! This salad and arepas ! Oh boy ! Thank you so much !